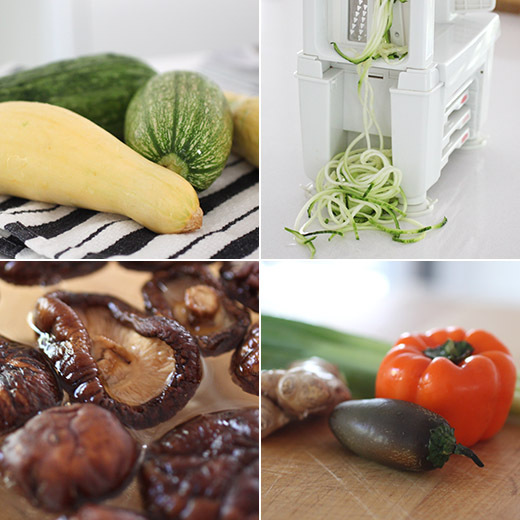 Cooking with lots of different types of seasonal produce is exactly what interests me. So, when a book comes along that’s all about encouraging home cooking with healthful whole foods, there’s a very good chance I’ll like it. The Whole Foods Cookbook: 120 Delicious and Healthy Plant-Centered Recipes , of which I received a review copy, inspires nutritious cooking with unprocessed plant foods. The recipes here are created in collaboration with Chad and Derek Sarno who also wrote The Wicked Healthy Cookbook. There are tips for cooking big batches of beans and grains, suggestions for creating layers of flavor without added oils or too much additional salt, and overviews for steaming, sauteeing without oil, and grilling. The book gives you all the information you need for a fresh approach to cooking and stocking your pantry. For instance, I’m looking forward to trying the risotto. There are two different recipes in the book, one for spring and one with butternut squash for fall and winter. But, the approach for both is the same, and other variations are suggested. For these risottos rather than sauteeing rice and aromatics in butter or oil, the steps have been altered to result in a processed-oil free dish. Here, leeks or onion or other aromatics are sauteed in a dry pan, and vegetable broth is added to deglaze when the vegetables begin to brown and stick. Cooked rice is added and mixed with the vegetables, and the richness comes from a pureed cashew cream. Other interesting recipes include whole, roasted vegetables that look delicious like the Whole Roasted Spiced Cauliflower with a pureed tomato and red pepper coating and the Classic Celeriac Pot Roast that’s slow-cooked with potatoes and herbs. The guide to bowls includes options like a Citrus-Sesame-Glazed Tofu Bun Cha and a Chickpea-Nut and Broccoli Satay. There are also soups, sauces, salad dressings, dips, and sweets. I have some pears in my refrigerator that are now destined to become Riesling and Orange Poached Pears sweetened with orange juice and apricot paste instead of refined sugar. 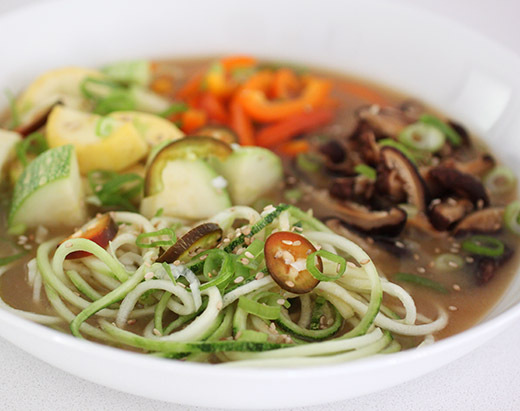 But first, I set out to make the Zucchini Noodle Bowl with Green Onion and Miso. My first instinct would normally have been to begin by adding oil to a pan to cook the vegetables, but here everything was cooked in vegetable broth with no added oil. To start, the big flavor of dried mushrooms was included to boost this dish. Dried shitakes were soaked in hot water while everything else was prepped. Grated fresh ginger was warmed in vegetable broth in a Dutch oven, and then miso, soy sauce, and rice vinegar were added and kept at a bare simmer. Chopped summer squash and zucchini were added to the simmering broth. Meanwhile, zucchini noodles were made with a spiralizer, green onions were chopped, and I had a pretty orange sweet pepper that I decided to add. The zucchini noodles were divided among the bowls, the rehydrated and drained shitakes were placed next to the noodles, and I added the sliced sweet pepper. The cooked squash was spooned into the bowls, and the broth was ladled over everything. Green onion, sesame seeds, and sliced hot chile garnished each serving. I’m delighted to report I didn’t miss the oil in this dish at all. The fresh flavors of the vegetables, the mushrooms, and the miso broth were fantastic just as they were. There are a lot of great ideas in this book that can be applied to other dishes. I love learning these little things to change up recipes I’ve been cooking the same way for years especially when the changes bring about a more healthful result. you are not doing this again to me, are you? one more cookbook in my virtual shelf? I love dishes loaded with seasonal veggies. This is one great low carb meal! With the colder nights and mornings a warm bowl of great flavored veggies sounds so inviting. Another cookbook to ponder! perfect for this rough transition from fall to winter! I love zucchini! I have to try this recipe Lisa ! Mushrooms and ginger are a great combination- I would certainly also like to try the citrus-glazed bun. Making risotto with already-cooked rice seems a bit strange to me, but I'm willing to give it a go! 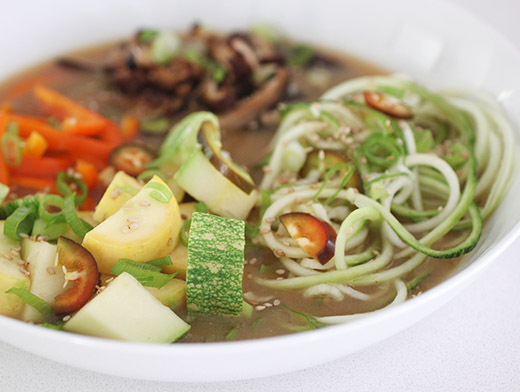 Lisa, your bowl looks delicious and yes, I love miso in everything...I have never used zucchini noddles in soup...it time to give this a try...thanks for the inspiration.